Please remember, these observations were true in 2000. Some things have probably changed, but many have not. Business attire in Ukraine is generally formal and conservative. Adoption Center clothing should be casual, yet conservative. Jeans are fine. For court appearances, clothing should be business casual. Slacks and a shirt with a collar for men (ties optional); conservative dresses for women. Visit to orphanage, walking in Ukraine, or any other day, clothing can be whatever is comfortable. Jeans, shorts, T-shirts, and dresses are all fine. Ukrainians can be seen wearing a variety of all types and colors of clothing; however, most women prefer to wear dresses and skirts more than pants. Ukrainian clothing is not quite as sturdy as American clothing. Most Ukrainian clothing is washed by hand and hung out to dry. They usually will not survive washing machines back home. Placing your thumb between your first two fingers is the same as flipping someone off. Shaking hands with a person over the threshold of a door is considered bad luck by some Ukrainians. If you give flowers to someone, be sure that you give an uneven number of flowers. An even number of flowers is only given to people in mourning. Women wearing black outfits, or black scarfs worn on their head, are usually in mourning. They may be in mourning for as much as three to six months after their loved one’s death. Be prepared to offer, or give if asked, any cigarettes, snacks, gum, or snacks you have with your Ukrainian friends. There must not be any Humane Societies in Ukraine. Stray dogs and cats are everywhere. Stray animals are basically ignored by most Ukrainians. They are allowed to wander almost everywhere, even inside restaurants. You will see beggars. Whenever you travel abroad, you should not hand out money to strangers. There are people that watch for foreigners to do so, and will target you for mugging. Sometimes, beggars, especially children, make more money than the average working Ukrainian. Everybody smokes. Cigarettes are sold in the market and at most street corners. Pornographic magazines can be found in the markets completely visible to all. Most cities in Ukraine have phone systems that will allow you to dial only within the city…even from pay phones. If this is the case, it will not matter if you have calling cards or plan on calling collect. When staying in someone’s flat, the owner oftentimes will not allow you to make international calls, even with a toll-free calling card because previous residents have claimed to be using calling cards, but the owner received a phone bill long after the residents had left. Owners usually will allow residents to receive calls though. You can always visit a city’s Post Office, purchase calling time for America, and call home in their phone booths. The Post Office charges 12-13 greevna per minute for calls to America, which is about $2.30. Expensive! To make an international call from Ukraine, first dial 8, and wait for a new dial tone. It may be several seconds. Next, dial 10, followed by the country code, city/area code, and phone number. For people calling you while in Ukraine, Ukraine’s country code is 380 and Kyiv’s city code is 44. The cheaper communication method is to locate a nearby Internet (Cyber) Cafe. Not all cities have Internet Cafe’s though. The cafe’s typically have about ten computers that people can play games on or access the Internet from. It usually only costs about six greevnas per hour ($1.20). A typical Ukrainian “toilet” is a hole in the ground. Many of these “toilets” are actually made of porcelain, just like any other bathroom appliance. Typically, they have a small track running downhill into the hole. A foot rest with traction lines is usally on both sides of the track. 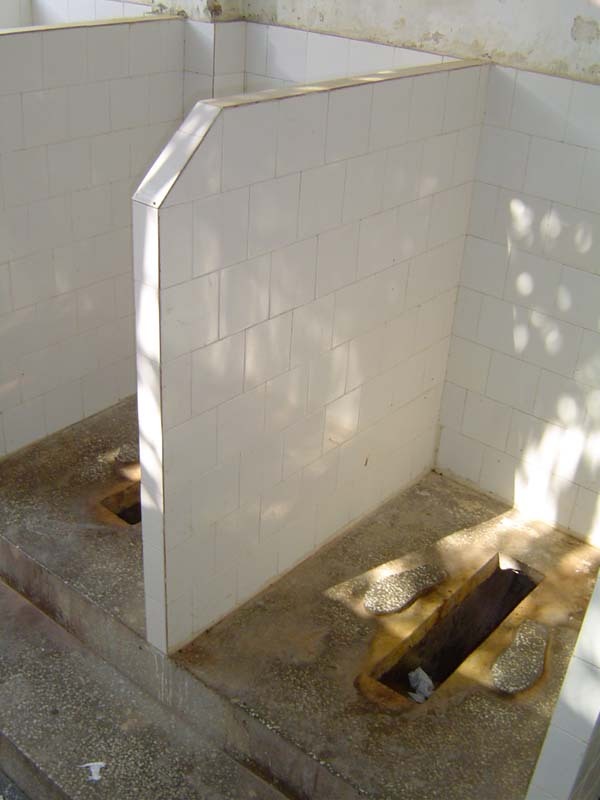 This type of “toilet” is not just in the country. It can be found even in the major department stores. Most flats (apartments) have actual toilets with seats in them. Many bathrooms do not have toilet paper. Bring your own always. You can always buy toilet paper at the market. Toilet paper is easily purchased in the markets of Ukraine. There are different varieties, but all are more rough than most American brands. Many public facilities will charge you to use the bathroom, typically 50 coins. Every flat (apartment) has a gas stove and refrigerator. Hotel rooms do not have stoves and may not have refrigerators. Many flats have cockroaches. Though this seems to make most Americans think the flats are dirty, this is not so. A flat is an apartment. The flats that we stayed in were nice, but that says nothing for the conditions in flats in the same building or floor. Just like in America, if your neighbor’s apartment has cockroaches, you have cockroaches. Only some cities have hot water. It is probably more common to not have hot water than it is to have it. It is safe to take baths and showers, even though it is with Ukrainian water. Avoid getting the water in your eyes and mouth. It will happen, just try to avoid it as much as possible. After washing your hands with water or using any sort of restroom or public facility, clean your hands with anti-bacterial lotion (the kind that doesn’t need water). If you would like to purify Ukrainian water, leave a pot of boiling Ukrainian tap water on the stove for ten minutes. However, we found the water tastes nasty, but is useful for things that bottled water would be wasted on. Brush your teeth using bottled or boiled water. Use a clean glass or cup to clean your brush in. Salt and Pepper are referred to as “spices”. Salt is often served (and found in flat cabinets) in a small dish for people to grab a pinch from. Bread is served at almost every restaurant. Butter is not served with bread, though you may request it at some restaurants. You do not get refills on drinks anywhere. Ukrainian salads are not American salads. A Ukrainian salad is any vegetable (tomatoes, cucumbers, cole slaw, pickles, green peppers, onions, etc) put on a dish or in a bowl. Coca-Cola has a huge foothold in the Ukrainian market. Pepsi also has a good foothold, but is not as overwhelming as Coke’s. There are no diet cokes in Ukraine. Do not drink water in Ukraine unless it comes from a sealed bottle. The water may contain bacterium/parasites that your body will not have resistance to. When you order drinks, order it in the bottle or without ice. The ice is made from Ukrainian water. When ordering bottled water, get “water without gas” (carbonation). Carbonated drinks can be found everywhere in Ukraine. Bottled spring water without carbonation is sometimes hard to find. Be sure you do not get mineral water either…it’s not a pleasant taste. Plain, uncarbonated bottled water was hard to find. We bought a jug of “baby water” once in a baby store. Mayonaise is served with French Fries at McDonald’s. Ketchup is not served normally in Ukraine. You must ask and may be charged for it. At McDonald’s, Ketchup costs 70 coins. Ketchup is nasty in Ukraine. McDonald’s ketchup is the only decent ketchup we found. McDonald’s does not serve breakfast foods in Ukraine. McDonald’s in Ukraine offers hamburgers, cheeseburgers, double cheeseburgers, FishMaks (Filet-O-Fish), BigMacs, chicken sandwiches, and Happy Meals. No chicken nuggets. Fish, crawdads, chicken, bread, seeds, fruit, vegetables, milk products, eggs, sausage, and beef can be purchased out in the open market, without any type of proper sanitation or refrigeration. You should be very cautious of such food on the open market. Fruits and vegetables are fine to purchase and eat from the market as long as you peel them them first. It is not recommend that you eat seafood in Ukraine due to possible water contamination. Close your eyes, hold onto something, and pray. Almost all Ukrainian taxi drivers should be recruited by American racing circuits. The drivers know the exact width of their cars. The horn solves all problems. Who has the right-of-way? Your driver. Pedestrians do not have the right-of-way. If you hear a car horn while you are in the street, run to the nearest curb. If you hear a car horn while you are on the sidewalk, run into the nearest building. Most roads do not have lines to indicate lanes. Roads that do have lines to indicate lanes are driven on just like those without lines. Most roads have potholes that your driver will swerve all over (ALL OVER) the road to avoid. If there is a large pothole in the road and another vehicle is coming towards you, your driver has the right to swerve in front of them and make them stop. If there are cars already in the turn lane, it is okay to make a new turn lane to cut in front of them. It doesn’t matter how many cars are between your car and the intersection, your driver will find a way to get to the front. Most cars are the typical Eastern European small boxy cars that were created in the 70’s. All cars are stick shift. Most cars do not have air-conditioning. The rear left door of most taxi cabs cannot be opened. Red means stop, then comes yellow which means “get ready”, and then green means go. If you are crossing the road and you see a yellow light, run to the nearest curb. Drivers take off on the yellow lights. Red lights can be ignored if your driver is in a hurry. Flashing yellow lights are broken. They could mean caution, but it wouldn’t matter anyways. A typical drive in a taxi costs 5 to 10 greevna, which is equivalent to $1 or $2. There is no need to tip drivers. Be quiet when approaching a taxi with your translator. Let your translator negotiate a price before the driver hears your English and knows you are a foreigner. You’ll get a better price this way. The above driving rules are void if there is a “road cop” standing nearby. Be prepared to stop for cattle and goats on country roads. Always check the seat when you get out of a taxi to be sure you did not forget anything.